Steel blue -- S - Dispatch time 1-3 workdays Steel blue -- M - Dispatch time 1-3 workdays Steel blue -- L - Dispatch time 1-3 workdays Steel blue -- XL - Dispatch time 1-3 workdays Steel blue -- XXL - Dispatch time 1-3 workdays Black -- S - Dispatch time 1-3 workdays Black -- M - Dispatch time 1-3 workdays Black -- L - Dispatch time 1-3 workdays Black -- XL - Dispatch time 1-3 workdays Black -- XXL - Dispatch time 1-3 workdays Dispatch time, what's this? Men's Merino wool base layer pants. 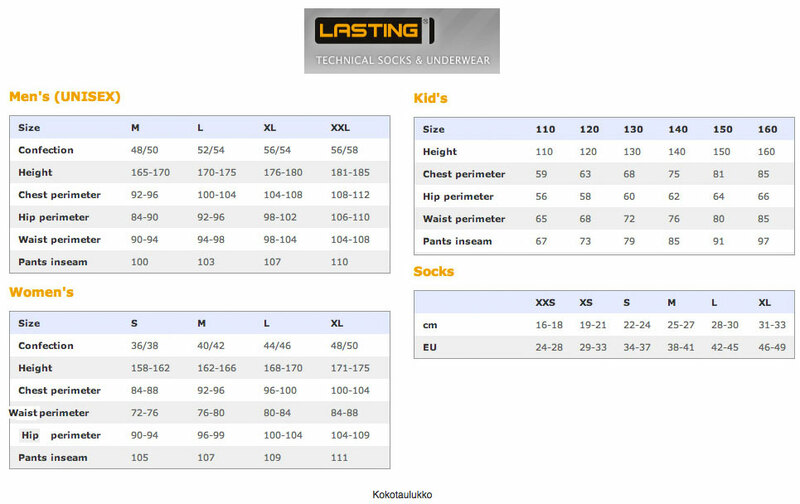 Lasting Atok Pants - Men’s Merino wool base layer pants. As Merino wool is comfortable even when moist, and needs to be washed less frequently than synthetic materials, it is a great material choice for outdoor activities. A one piece base layer onesie for skiing and other cold weather outdoor action. Men's stretchy base layer bermudas.